Aurora House is a wonderful Pacific Northwest style home. Its open concept design, with floor to ceiling windows, showcase the remarkable natural beauty of the San Juans. Located on a waterfront parcel; the home provides lovely unobstructed views across the sea to the Canadian Coastal Range. End of country road privacy guarantees a quiet, relaxing vacation. A huge deck with a gas BBQ, teak dining set, and 6 person hot tub look out over the ocean. The deck is also a great spot to view deer, otter, seals, sea lions and eagles. You may even catch a sighting of the resident Orca Pod. A short walk will take you to a serene park with a trail and steps leading to a peaceful cove beach. We offer wi-fi for your laptop, satellite TV, Netflix, and plenty of books, movies, and board games. For music lovers; there is a quality sound system that can connect to your device. The home has two queen bedrooms, one bunk bedroom, two baths, and a nicely equipped kitchen. We are 5 miles from the main village on the island, Eastsound. It's a quaint, walk-able small town populated with friendly locals. The village is fun to explore. It offers shopping boutiques, a farmers market, movies, a playhouse, art galleries, bookstore, library, coffee shops, and many great restaurants. Orcas Island is graced with outstanding public lands. It's a perfect destination for nature lovers and hikers of all skill levels. We are just 8 miles from one of Washington's scenic coastal parks, Moran State Park. The park features excellent trails, freshwater lakes, and the panoramic Mount Constitution view. Well marked island hikes range from easy loop trails through old growth forests to all day strenuous mountain climbs. In addition, you can choose to enjoy the simple pleasure of walking the quiet stony roads that access the house. The San Juan Islands are one of the most stunning places you could go for a kayak paddle. We recommend booking a private tour with a local guide. Be sure to charter a sailing or boating trip and visit one of the nearby marine state parks. You can also board the inter-island ferry to the charming town of Friday Harbor. Another ferry will take you to Vancouver Island where you can catch a bus to the historic city of Victoria BC. Aurora House is ideal for a couples retreat or small family getaway. Just bring your clothes and groceries; everything else is provided for you. Spend your holidays in one of the most beautiful spots in the world. We know you will have a great time! We are located off the beaten path in a quiet area; yet are just minutes to the many wonderful amenities of the Village and fantastic hiking trails at Moran State Park. The snow capped Canadian Coastal Range is visible from across the water on clear days. Satellite in TV room only. New HD Smart TVs with Netflix in all bedrooms. Please bring any cords and adapters needed to connect your gizmo to the Smart TVs HDMI ports. Includes local hiking and kayak trail guides. During the warmer months, alfresco dining on our waterfront deck is a must! No steps between driveway and front entrance. The front entrance provides access to the first floor; which includes the kitchen, living room, bathroom and bedrooms. The home is not ADA compliant and is not suitable for guests with extensive mobility limitations. Comfortably furnished, had all cookwear needed for simple meals. Home was clean and tidy. Hot tub was a special treat. Definitely recommend and would stay here again. Great property & great view! The house was spacious and has a marvelous view. 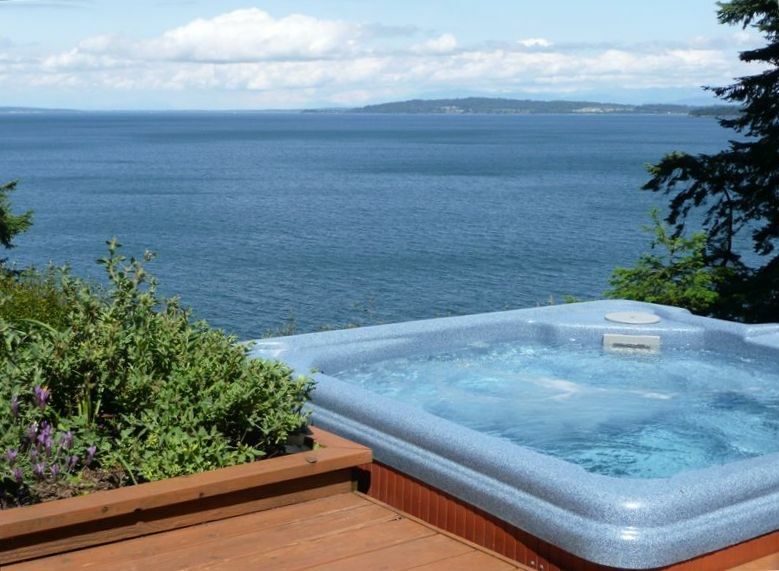 There is a hot tub with an amazing view. Close to Eastbound but with privacy since it is up the mountain. I recommend this property to anyone wanting a great getaway! Exactly as we had hoped for, and as represented. We plan to return. Our best experience for a secluded NW island vacation. The San Juan’s could not be better represented. The views are amazing, access to a bluff and beach, but the great thing about the house is the privacy, excellent views, cozy couches and beds, and a nice kitchen to cook in. We cooked dinner at home each night, watched movies, built fires in the wood fireplace, and spent hours looking at the water. The hot tub is a great bonus, too! Would definitely return. Aurora House is a warm and well-appointed home in a quiet and secluded part of the island yet close to town and hiking trails. The views of the water and mountains are fabulous, the house is immaculate, and Debbie and Tony are gracious and responsive hosts. Perfect getaway - great for families! The Aurora house was the perfect home away from home during our Orcas stay. It was cozy, clean, well-appointed, and had a gorgeous view of the Eastsound. We would definitely stay here again! Orcas Island's peaceful, laid back vibe is nicely balanced by a thriving arts community, award-winning restaurants, boutiques, cafes, galleries, and a history museum. The abundant outdoor activities combined with a backdrop of pristine natural beauty and temperate climate make this Pacific Northwest island a very special place.